Millet is very high in fibre, protein, minerals and vitamins. It is often used in the diet of people who are allergic to gluten. It has previously been neglected, however, that the interest of a healthy diet has increased significantly in recent years, and thus increase in the demand for this grain which can be used as an alternative source of protein. Supporters of the gluten-free diet as well as people who are suffering from celiac disease, cherish this extremely beneficial food and use it daily due to its positive qualities. This plant should find a special place on our table. Millet grains are widespread and are grown mainly for human needs. It is an important crop in areas of semi-arid or tropical climates such as those in Asia and Africa. Enough is grown in India, Nigeria and other countries. This grain is favoured because of its productivity but also because it is easy to cultivate it. It is not a too demanding plant, which is another reason why it is so prevalent in the world. It is believed that millet grains originated in West Africa. Historical data shows that it had a very important role in that region where it was harboured for 10,000 years. It has a little grain, it is a hardy plant and belongs to the grass family. 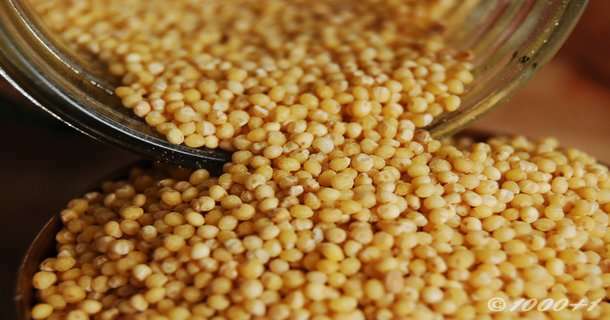 Due to its positive characteristics, millet in the diet can be used as medicine. The plant is easy to digest, contains a large amount of lecithin and is great for strengthening the nervous system. Millet grains contain a complex carbohydrates which are gradually dissolved and therefore represent a good selection of foods for diabetics. The good thing about this plant is that it is mainly grown on suitable land so it can be grown without the use of chemical pesticides and fertilizers. This grain does not cause allergies and is easy to digest. The plant millet is known not to contain gluten and is used as an alternative for people who are sensitive to it. It is especially rich in minerals such as iron, magnesium, phosphorus and many other elements. Certain types of cereals are rich in fibre, protein and fat which makes them very suitable for dieting. Other types gradually release glucose so they have a greater effect on the human metabolism. If you want to have a healthy heart millet cereal is the right choice, you can also use it due to the fact that it is extremely rich in magnesium. One cup of cooked millet can meet even 19 percent of the daily requirement for this mineral. Due to all these positive characteristics it is necessary to include wheat in the daily diet. Another good feature is that millet reduced the severity of asthma attacks and reduces the frequency of migraines, and magnesium in it lowers the pressure and the risk of a heart attack. This is especially important for people with atherosclerosis or diabetes. Ingredients from this plants play an important role in the structure of every cell in the body. It has a great influence on the formation of bones due to phosphorus contained in it. In addition, phosphorus out there is an essential component in a number of other compounds that are essential for life including adenosine triphosphate also known as ATP. This molecule is essential for the human body which makes phosphorus essential as well, and this plant makes an invaluable source of that particular element. Due to its chemical composition millet is important for nucleic acid, and thus the genetic code. With all this it may find its application in the metabolism of fats since it relies on the phosphorus, as well as in cell membranes and structures of the nervous system. The plant successfully reduces the risk of type 2 diabetes. According to the studies, millet in the diet and other cereals rich in magnesium have a significant impact on this disease. Research shows that it is permissible to consume at least 51 percent of whole grain cereals in relation to your weight which reduces the risk of heart disease and certain types of cancer, but new research has shown that the regular consumption of whole grains also reduces the risk of diabetes. The food which is rich in fibre, as is the case with a gluten-free cereal millet, it helps women to avoid the occurrence of gallstones. This phenomenon was created by a study conducted by experts in the United States. The study found that those who eat plenty of fibre have a great chance to be less at risk of developing gall stones by 17 percent compared with women who ate less food of this composition. The study also showed that food increased by 5 grams of the fibre reduces the risk by 10 percent. Therefore millet in the diet helps prevent insoluble fibre by reducing acid secretion, increases insulin sensitivity and reduces undesirable triglycerides. One study showed that a gluten free millet can have a significant impact in the prevention of breast cancer, especially in women who did not enter menopause. Scientists believe that women of this age should eat about 30 grams of these foods per day to reduce the risk of cancer. If you adhere to this, there is a possibility that the risks are reduced by 52 percent compared with women whose diet does not include these foods. The greatest protection is provided by whole grain plants for which it is recommended that women who are in the risk group eat at least 13 grams of millet a day. Herbalists claim that millet grain has the ability to help people who have kidney stones. It has been for many years been used in folk medicine and is considered to be very effective in cleaning the kidneys, eliminating the sand and even removing small stones from the kidneys and bladder. This recipe can be used as a medicine by boiling about 200 grams of millet with hot water in the evening, then pour the content in the 3 litre glass jar and fill 2/3 of the jar. Close the jar and shake the contents, leave it in a warm and let it stand all night. The next morning, shake once more your jar and you should notice a white fluid. Pour the liquid from the jar into another bowl and drink it during the day as long as you want. Do not throw away the rest of the contents of the jar but make millet porridge that you eat for breakfast. In the evening do another round in the same way. The fluid should be drunk for two weeks. According to the American Lung Association, nearly 20 million Americans suffer from asthma, which is the cause of a large number of absences of children from classes. Studies have shown that whole millet and fish may reduce the risk of child asthma by about 50 percent. The researchers used a survey to get the results of what children eat. It was estimated that the consumption of certain foods such as fish, fruits, milk and certain types of grains can reduce the risk of asthma. Similar to other grains this plant should be washed well before cooking. After washing the majority of recipes for millet dishes say to boil the water. Once the liquid starts to boil, reduce heat, cover and leave it for about 25 minutes. The texture of cooked grains will be similar to the cooked rice. If you want to have a creamy texture, stirring frequently and adding small amounts of water will do the trick. Millet in the diet is very important and is used in certain countries to produce beer. So this plant in countries like Thailand but also in East Africa has become much appreciated. In Nepal it is used for similar purposes while in the Balkan countries such as Romania and Bulgaria it is used to produce the well-known beverage “Boza”. Millet porridge is a traditional dish in Russia, Germany and the Chinese cuisine. In Russia it is has sugary or sour taste when eaten with meat. In China it is eaten without milk and sugar, but often with peas, potatoes, beans and various kinds of flask, while in Germany with sugar and apples or other fruit. Millet grains can be fed to young children and even babies. Of course, to babies it is given in the form of porridge. Often there is the question of whether pregnant women can consume this grain. The answer is yes, what is more it is ideal for pregnant women because it is very rich in calcium and iron. It is also recommended to mothers and people suffering from diseases such as diabetes. One cup of cooked cereal millet contains about 174 grams and it has about 207 calories. In addition this plant contains copper, phosphorus, magnesium and other useful ingredients. It is a good source of nutrients, has a sweet taste and is considered a very useful cereal. Because of all this, many nutritionists recommend millet in the diet, especially to people who have these health problems, and the gluten-free cereal will also help you eliminate the extra weight. In itself this extraordinary plant contains about 25 percent of the phosphorus, 24 percent of manganese and 19 percent of magnesium. Whole grain cereals contain in addition to dietary fibre a whole arsenal of other useful nutrients. Among its members are the fatty acids, oligosaccharides, plant sterols and stanols and saponins. Millet grains are also a very important source of fat-soluble, water-soluble and insoluble antioxidants but also vitamin E, selenium, phenolic acids and many other substances that make this plant very useful. It represents a valuable source of phytoestrogens, which has a very good influence on lowering high cholesterol. You can add the peas, beans or cabbage. This dish of millet is prepared in a way that you chop vegetables into smaller pieces. Wash and soak millet by pouring over it 1.5 of a cup of boiling water and let sit in it 2-2.5 h.
Heat the oil in a pan, add cumin, pepper, and curry leaves, when you fry it a little insert the previously chopped onions, ginger and green pepper and cook until onion is tender. Then add the other vegetables, curcumin, and salt and leave it on low heat for about 2-3 minutes. Add the prepared millet with water in which it was soaked and check whether it is necessary to put more salt. Cover and cook over medium heat for about 7 minutes and then remove the pot until the pressure reduces. Then add butter and stir well. Fruit, milk and brown sugar. In a saucepan heat the oil. Add the millet and fry until it changes colour to brown. Add the boiling water, cover and leave for 30 minutes until the liquid is absorbed. Let it stand for 5 minutes and then serve by adding milk, sugar and fruit of your choice. 1 tablespoon of Vegeta spice. Preparation: Preheat oven to 200 degrees. Put water to boil in a medium saucepan. Add millet, reduce heat, cover and let it stand for about 25 minutes. Remove from heat and leave it to cool for 5 minutes. While cereal is cooked prepare peppers and clean them from the inside. Put them in the microwave and keep it there for 15 minutes until they turn soft. In a frying pan over medium heat add the olive oil, onions and mushrooms. Fry until the onion is tender. Add garlic and fry until it becomes darker. Add the water and cook the tomatoes. Add salt, pepper and Vegeta spice. Cook over medium heat for about 10 minutes until it thickens. Add filling to millet. Mix equally and then fill the peppers and place them in a bowl. Add wine to pan, pour tomato sauce over peppers. Cover with aluminium foil and cook for 30 minutes. Millet grains can be prepared in other ways, so you can let’s say in your favourite cake mixture add about 100 grams of millet, to get a different taste or improve the well-known cake. Also, feel free to add it in the dough and thus, with the addition of other grains, you can make integral bread, or millet cake. Another good way that you can take advantage of this plant is to add it in a mixture of muffins. Whichever method you choose you will not go wrong.